Showing items in category Newfoundland, sorted by newest listed first. 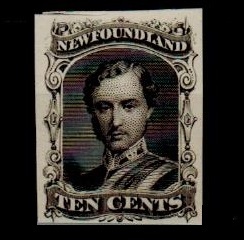 NEWFOUNDLAND - 1865 10c IMPERFORATE PLATE PROOF in black of the 'Prince Consort'. 1865 10c 'Prince Consort' (SG Type 8) IMPERFORATE PLATE PROOF printed in the issued colour of black on thick card. NEWFOUNDLAND - 1944 'PASSED BY MILITARY CENSOR NO.24' cover. 1944 (AP.22.) 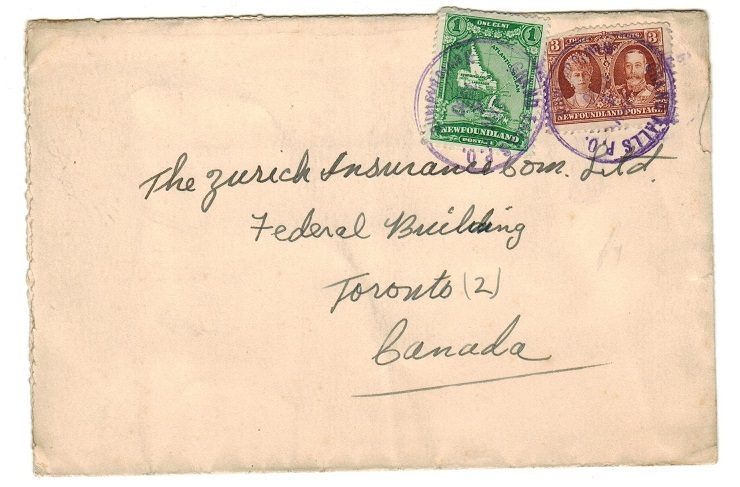 cover addressed to Canada bearing 7c 'Air mail' adhesive tied by C.A.P.O./No.1 cds with scarce PASSED BY MILITARY CENSOR No.24 strike in black at lower left. NEWFOUNDLAND - 1942 'PASSED BY MILITARY CENSOR No.52' cover. 1942 (DE.2.) 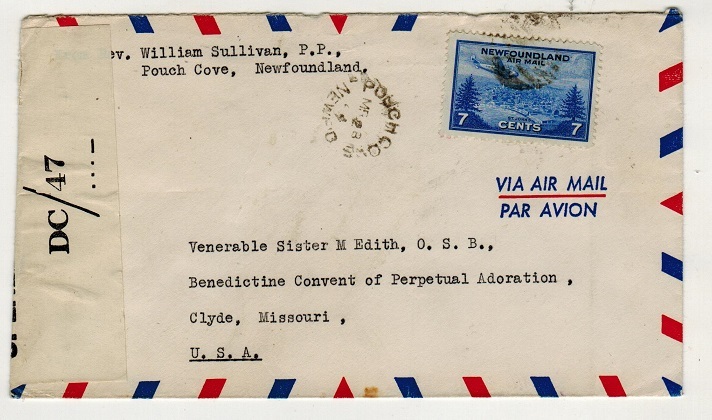 use of 'The Salvation Army/Serving With Canadian Forces' envelope addressed to Canada bearing 3c pair tied by C.A.P.O./No.1 cds with scarce PASSED BY MILITARY CENSOR No.52 strike in blue at lower left. NEWFOUNDLAND - 1943 'PASSED BY MILITARY CENSOR No.13' cover. 1943 (NO.14.) 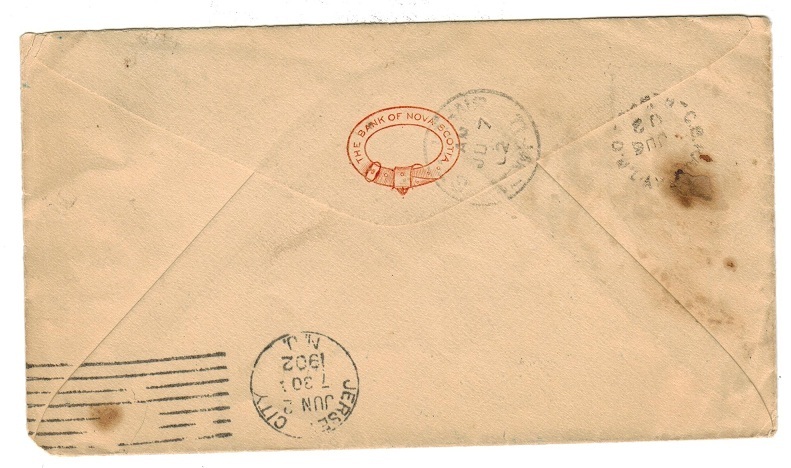 cover addressed to Montreal (small piece from top edge missing from rough opening) bearing 3c (x2) tied by C.A.P.O./No.1 cancel with PASSED BY MILITARY CENSOR 13 h/s at left. NEWFOUNDLAND - 1941 'PASSED BY MILITARY CENSOR No.9' cover. 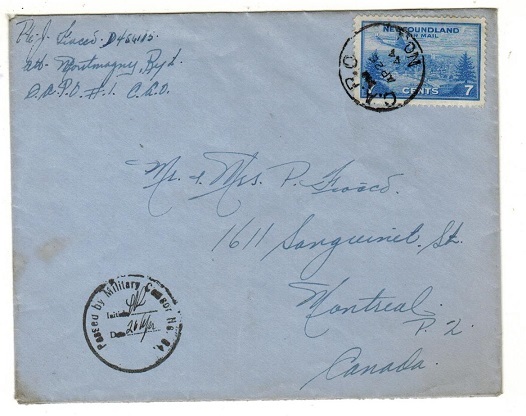 1941 cover addressed to Canada bearing 1c and 4c adhesives tied by the 'Savings' box slogan strike with violet d/r PASSED BY MILITARY CENSOR No.9 h/s at lower left dated 27.8.41 in manuscript. NEWFOUNDLAND - 1938 (KEVIII) 'photographic' ESSAY of the proposed un-issued 4c. 1938 (King Edward VIII) 'photographic' ESSAY of the proposed un-issued 4c adhesive. NEWFOUNDLAND - 1929 4c IMPERFORATE PLATE PROOF pair on ungummed cream paper. 1929 4c re-engraved (SG type 91) IMPERFORATE PLATE PROOF pair in reddish purple on ungummed cream paper. NEWFOUNDLAND - 1936 10c rate cover to Sandy Point used at ROBINSON. 1936 (NO.19.) 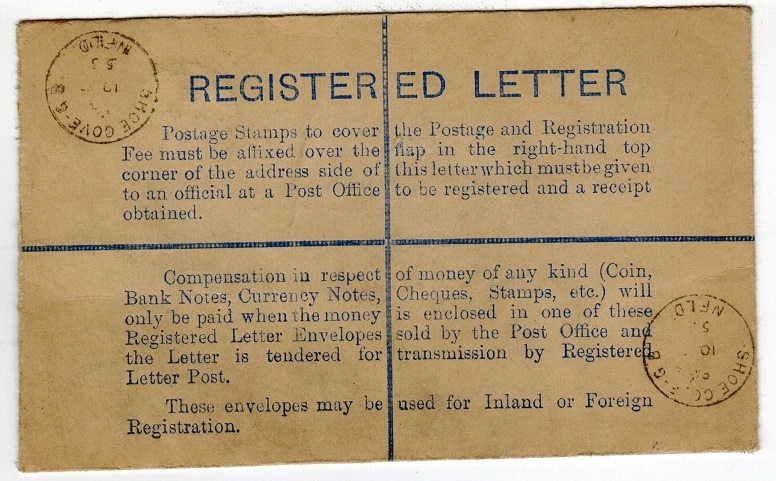 registered cover aaddressed locally bearing 10c adhesive tied by scarcer ROBINSON/NEWFOUNDLAND cds. Large SANDY POINT arrival b/s. 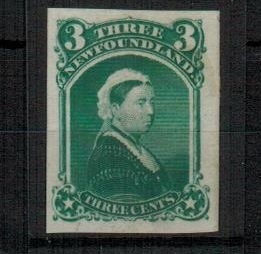 NEWFOUNDLAND - 1868 3c QV (SG type 14) IMPERORATE COLOUR TRIAL printed in blue-green. 1868 3c 'Queen Victoria' (SG type 14) IMPERORATE COLOUR TRIAL printed in blue-green on thin ungummed Indian paper. NEWFOUNDLAND - 1931 first flight cover to North Sydney. 1931 (AUG.23.) 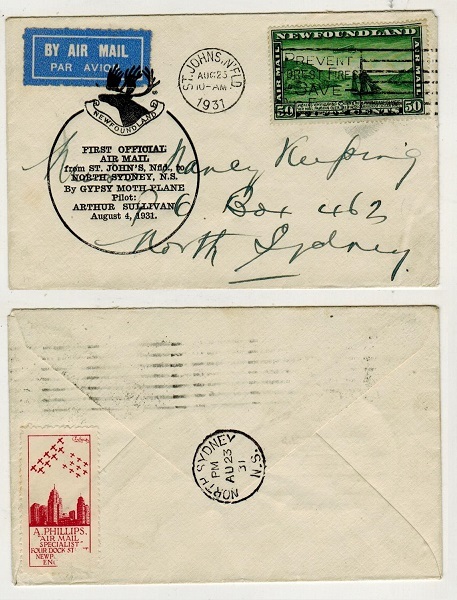 first flight cover addressed to North Sydney bearing the 50c 'air mail' adhesive (SG type 104) cancelled by ST.JOHNS/PREVENT FOREST FIRE slogan strike and struck at left by 'Caribou' crested FIRST OFFICIAL/AIR MAIL/FROM ST JOHNS NFLDF TO/NORTH SYDNEY NS/ BY GYPSY MOTH PLANE/PILOT/ARTHUR SULLIVAN/AUGUST 4th 1941 h/s. NEWFOUNDLAND - 1941 cover to USA cancelled AMERICAN FORCES IN NEWFOUNDLAND. 1941 (FEB.3.) 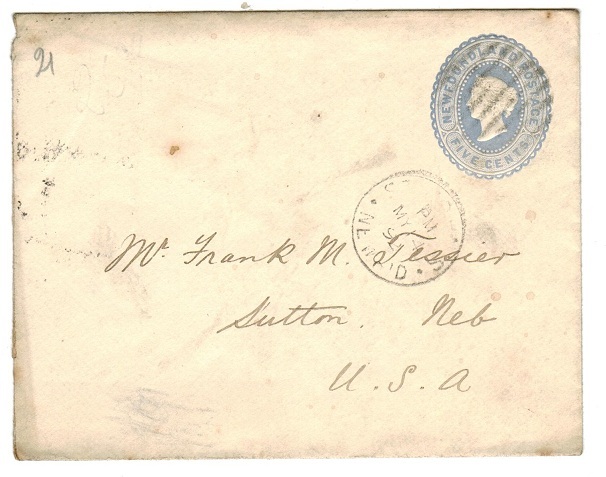 cover addressed to USA bearing US 1/2c (x6) tied by scarce AMERICAN FORCES IN NEWFOUNDLAND cds. NEWFOUNDLAND - 1944 7c rate 'DC/47' censor cover to USA used at POUCH COVE. 1944 (MR.28.) cover addressed to USA bearing 7c 'air mail' adhesive tied by POOCH COVE/NEWF'D cds and with black on cream P.C.90/OPENED BY EXAMINER/ DC/47 censor label at left side. (Little type NL7A). NEWFOUNDLAND - 1944 5c rate 'DC/41' censor cover to USA used at DEEP LAKE. 1944 (FEB.4.) cover addressed to USA bearing 5c adhesive tied by DEER LAKE/NEWF'D cds and with black on cream P.C.90/OPENED BY EXAMINER/ DC/41 censor label at left side. (Little type NL7A). NEWFOUNDLAND - 1944 7c rate 'DC/29' censor cover to USA used at POUCH COVE. 1944 (AP.22.) 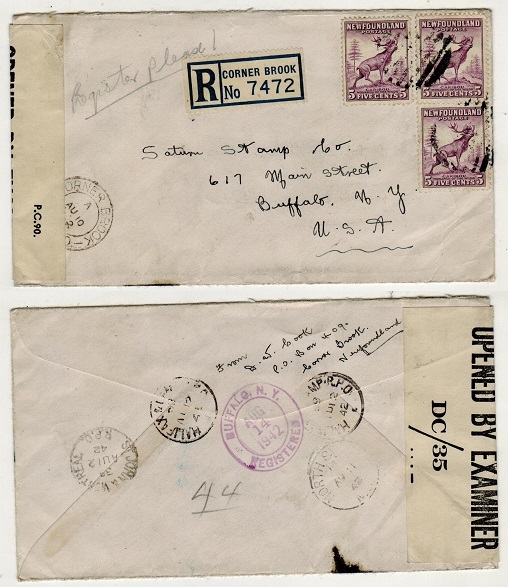 cover addressed to USA bearing 7c 'air mail' adhesive tied by barred duplex with POUCH COVE/NEFW'D cds at left and with black on cream P.C.90/OPENED BY EXAMINER/ DC/29 censor label at left side. (Little type NL7A). NEWFOUNDLAND - 1943 (circa) 7c rate 'DC/28' censor cover to USA. 1943 (circa) cover addressed to USA bearing 7c 'air mail' adhesive tied by ST.JOHNS slogan strike and with black on cream P.C.90/OPENED BY EXAMINER/ DC/28 censor label at left side. (Little type NL7A). NEWFOUNDLAND - 1943 7c rate 'DC/47' censor cover to USA used at POUCH COVE. 1943 (JU.3.) cover addressed to USA bearing 7c 'air mail' adhesive tied by POUCH COVE/NEWF'D cds and with black on cream P.C.90/OPENED BY EXAMINER/ DC/47 censor label at left side. (Little type NL7A). NEWFOUNDLAND - 1942 15c registered 'DC/35' censor cover to USA used at CORNER BROOK. 1942 (AU.10.) registered cover addressed to USA bearing 5c (x3) cancelled by barred duplex's with CORNER BROOK cds at lower left partly covered by black on white P.C.90/OPENED BY CENSOR/ DC/35 censor label. NEWFOUNDLAND - 1942 first flight cover to USA. 1942 (MAY.1.) 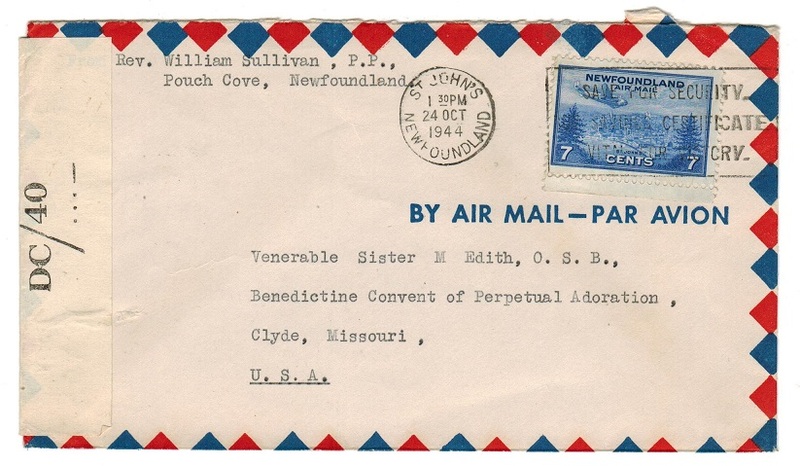 first flight cover addressed to USA bearing 1c and 8c adhesives tied ST.JOHNS/ SAVING BONDS slogan strike and with large circular FIRST FLIGHT INAUGURATING AIR MAIL SERVICE/ST.JOHNS TO MONCTON NB cachet applied. 8210 covers were flown on this flight. 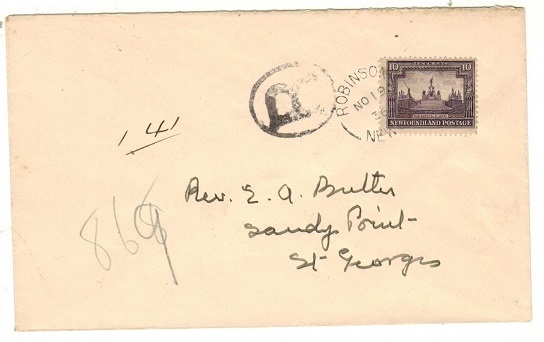 NEWFOUNDLAND - 1925 9c rate registered cover to USA used at SANDY POINT. 1925 (AU.18.) 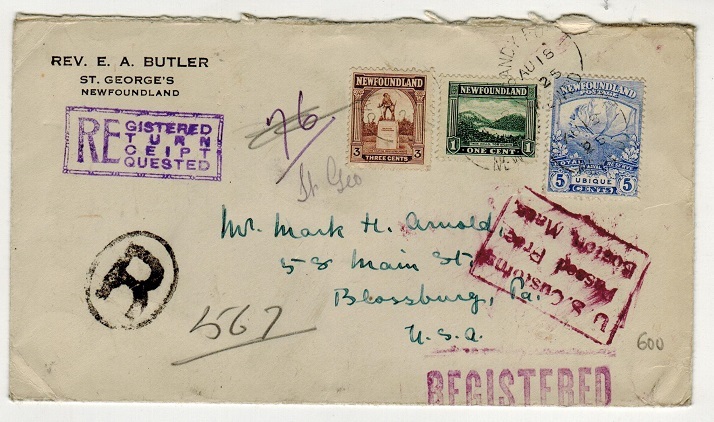 cover registered to USA bearing 1c, 3c pictorial and 5c 'caribou' adhesives tied by s/r SANDY POINT/NWFD cds's and struck at left by scarce violet boxed REGISTERED/TURN/CEIPT/QUESTED instructional handstamp. Nice item. 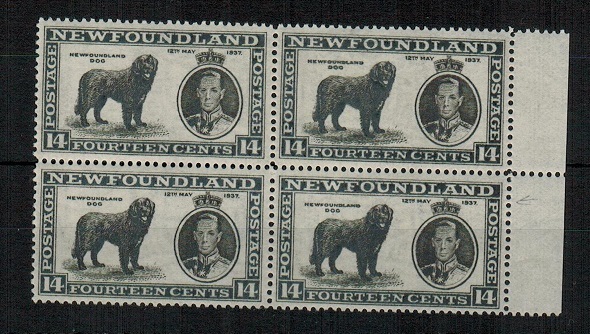 NEWFOUNDLAND - 1937 14c black U/M block of 4 with MAJOR RE-ENTRY. SG 216. 1937 14c black 'Newfoundland Dog' adhesive in a fine unmounted mint marginal block of four showing the MAJOR RE-ENTRY to 'May 12th' on one stamp. SG 216. NEWFOUNDLAND - 1862 6d rose lake pair cancelled GREENSPOND. SG 20. 1862 6d rose lake imperforate pair (cut close and with small edge cut) cancelled by fine GREENSPOND double arc cancel dated AU.7.1863. SG 20. NEWFOUNDLAND - 1931 first flight cover to Canada. 1931 (AUG.23.) 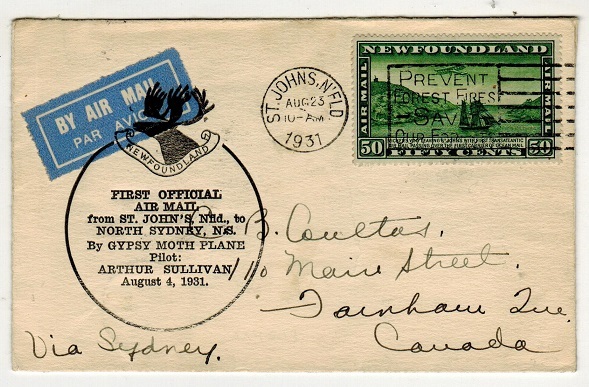 first flight cover addressed to Canada bearing the 50c Vickers Vimy biplane (SG type 104) cancelled by ST.JOHNS-PREVENT FOREST FIRES slogan strike and caheted with black circular FIRST OFFICIAL/AIR MAIL/FROM ST JOHNS TO NORTH SYDNEY/BY GYPSY MOTH PLANE/PILOT/ARTHUR SULLIVAN/AUGUST 4th 1931 h/s. 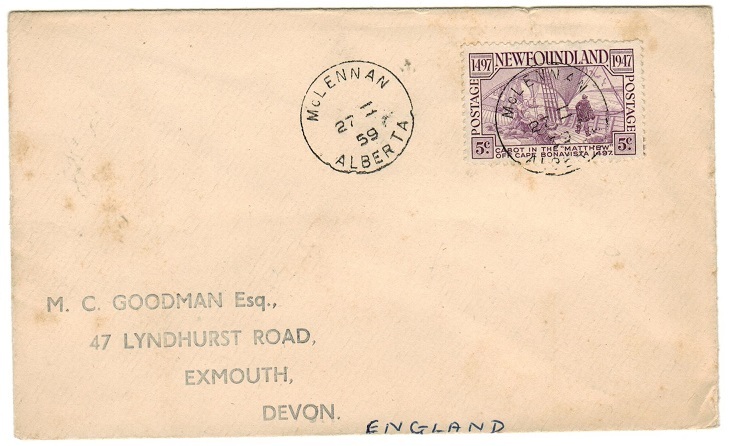 NEWFOUNDLAND - 1931 registered first flight cover to UK. 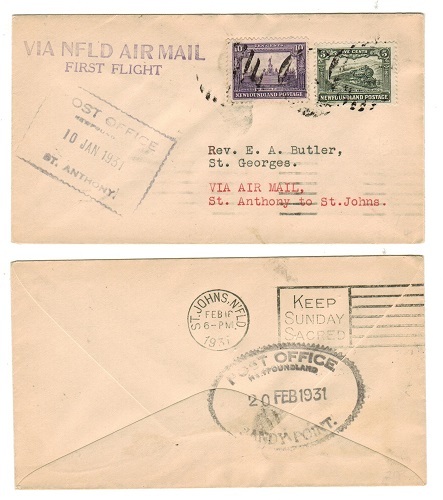 1931 (JAN.29) registered first flight cover addressed to UK bearing the 'Air' 15c & 50c adhesives (SG type 103+104) cancelled by ST.JOHNS TO ST.ANTHONY special violet commemoration h/s with additional violet boxed POST OFFICE/NEWFOUNDLAND/14 FEB 31/ST.ANTHONY h/s for returned flight. 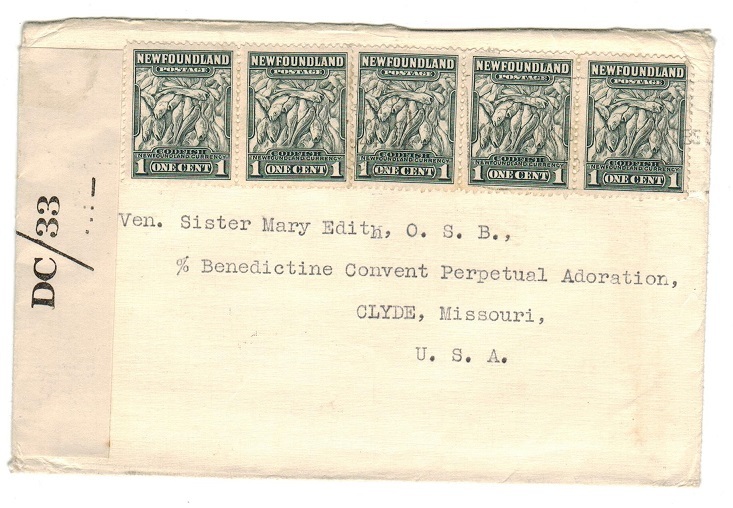 NEWFOUNDLAND - 1920 3c/15c surcharge cover used locally at TRINITY. 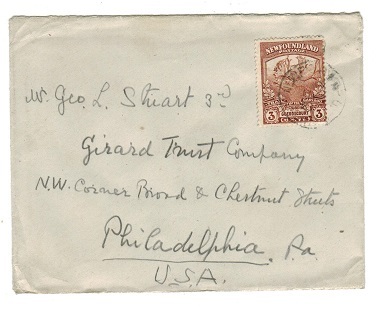 1920 cover addressed locally to St.John's bearing the 3c on 15c bright scarlet (type B) adhesive (SG 146) tied by smudgey 'cork' type cancel with TRINITY/NEWF'D cds at left dated SP.3.20. 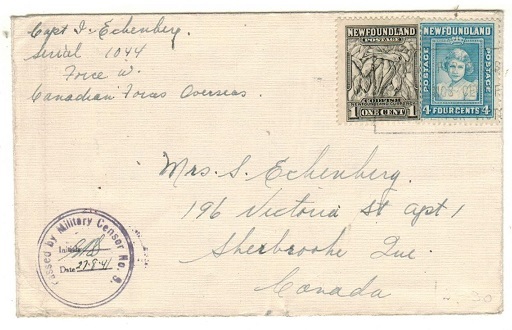 NEWFOUNDLAND - 1920 3c/15c surcharge cover used locally at KINGS COVE. 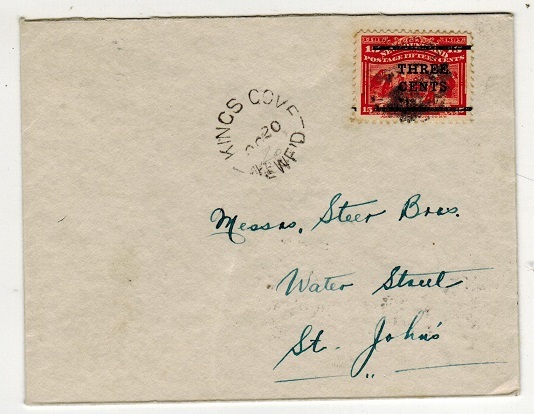 1920 cover addressed locally to St.John's bearing the 3c on 15c bright scarlet (type B) adhesive (SG 146) tied by smudgey 'cork' type cancel with KINGS COVE/NEWF'D cds at left. NEWFOUNDLAND - 1920 3c/35c surcharge cover used locally at JOSEPHS SAL. 1920 (SP.20.) 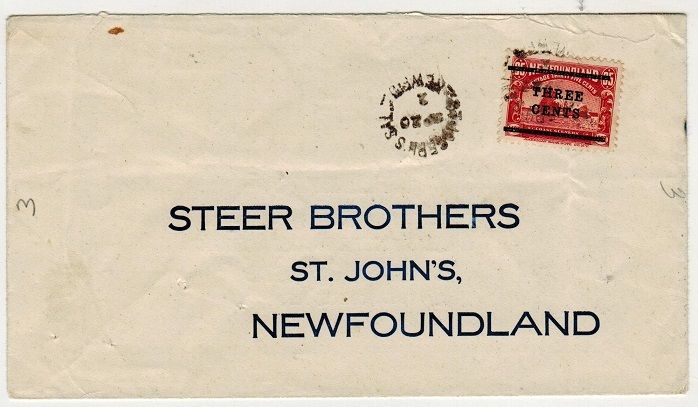 pre-printed 'Steer Brothers' commercial cover bearing the THREE CENTS black on 35c red (type b) cancelled by JOSEPHS SAL/NEWF'DL cancel. 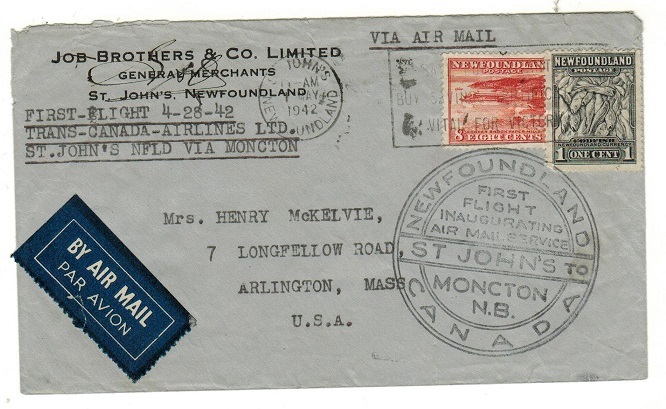 NEWFOUNDLAND - 1937 5c 'LADY HAWKINS' maritime cover to USA. 1937 (NO.5.) cover addressed to USA bearing 5c 'Coronation' adhesive tied by PAQUEBOT/BRITISH GUIANA cds with black circular C.N.S.LADY HAWKINS/POSTED/ON THE/HIGH/SEAS cachet applied at lower left. NEWFOUNDLAND - 1931 first flight cover. 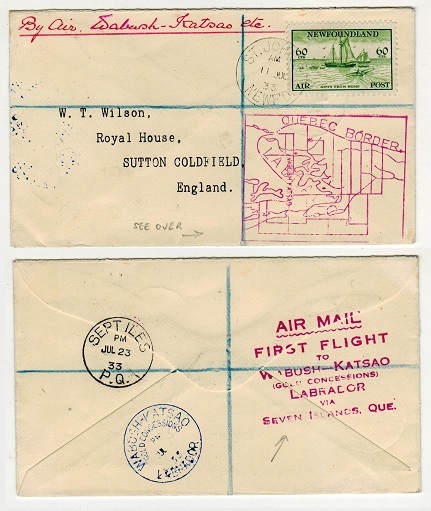 1931 first flight cover addressed to St.Georges bearing 5c and 10c adhesives tied by duplex cancel with violet boxed POST OFFICE/ST.ANTHONY transit strike on front and oval POST OFFICE/SANDY POINT (cog wheeled edge) strike on reverse. 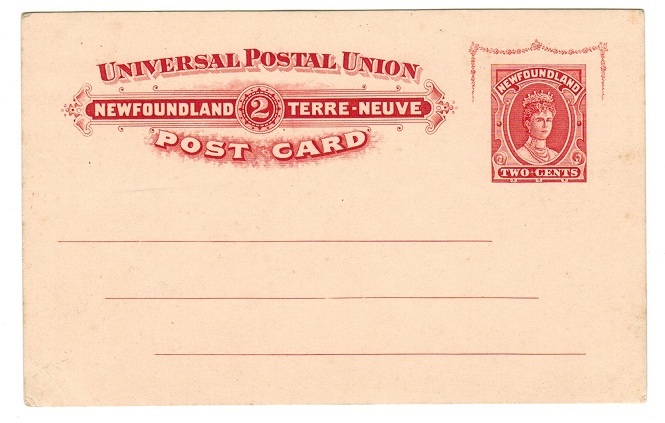 Violet two lined VIA NFLD AIR MAIL/FIRST FLIGHT h/s on front. NEWFOUNDLAND - 1933 first flight cover with rare 60c 'air' usage. 1933 (JUL.11.) 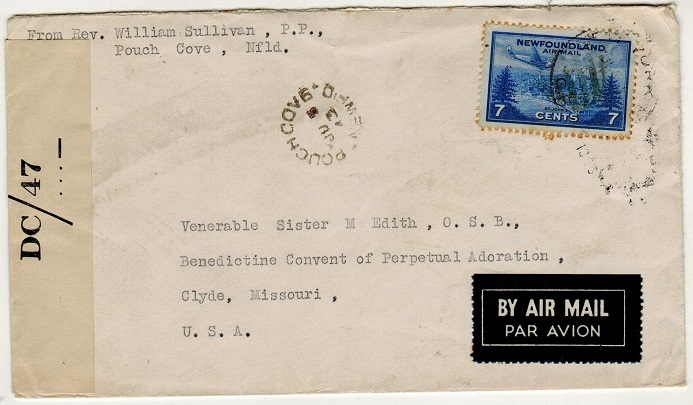 registered cover addressed to UK bearing 60c green 'Air' adhesive (SG233-scarce) tied by ST.JOHN'S/NEWFD cds with red QUEBEC BORDER cachet below. 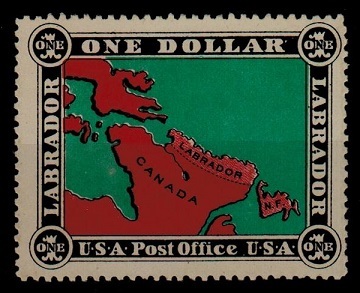 Struck on reverse by magenta AIR MAIL/FIRST FLIGHT/TO/WABUSH-KATSAO/GOLD CONCESSIONS/LABRADOR/ SEVEN ISLANDS h/s and with bluwe WABUSH-KATSAO b/s. Very scarce. NEWFOUNDLAND - 1947 5c rate cover to UK used at McLENNAN/ALBERTA. 1947 5c 'Cabot' adhesive (SG 294) tied to cover to UK by fine McLENNAN/ALBERTA cds. A late use in Canada. 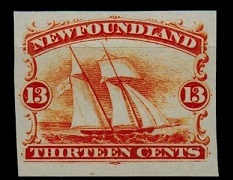 NEWFOUNDLAND - 1897 35c IMPERFORATE PLATE PROOF in red. 1897 35c IMPERFORATE PLATE PROOF (SG type 34) printed in the issued colour of red on thick white card. NEWFOUNDLAND - 1868 1c IMPERFORATE PLATE PROOF in dull purple. 1868 1c IMPERFORATE PLATE PROOF (SG type 12) printed in the issued colour of dull purple on thin white paper. NEWFOUNDLAND - 1865 13c IMPERFORATE PLATE PROOF in orange. 1865 13c IMPERFORATE PLATE PROOF (SG type 10) printed in the issued colour of orange on thin white paper. NEWFOUNDLAND - 1935 7c blue 'Silver Jubilee' on FDC used at CARBONEAR. 1935 (MY.6.) locally addressed first day cover bearing the 7c blue 'Silver Jubilee' adhesive tied by CARBONEAR/NEWF'D cds. 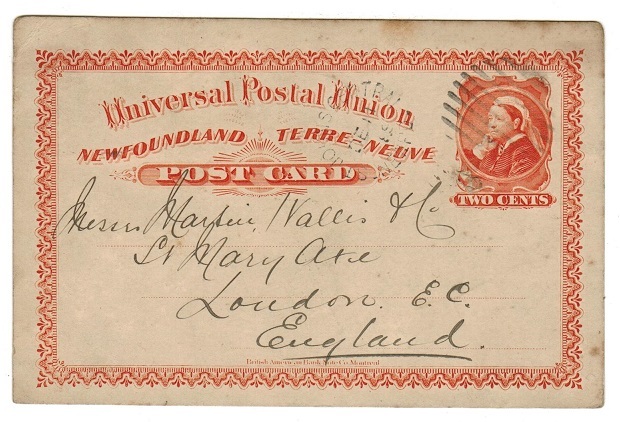 NEWFOUNDLAND - 1889 3c violet uprated PSE to USA. H&G 1a. 1889 3c violet on cream postal stationery envelope (size b) addressed to USA and bearing additional 1c adhesive tied by by barred duplex with light 'RPO' cds alongside dated NO.20.26. H&G 1a. NEWFOUNDLAND - 1889 3c violet PSE used at ST.JOHNS CENTRAL. H&G 1. 1889 3c violet on cream postal stationery envelope (size a) addressed locally and cancelled by barred duplex with ST.JOHNS CENTRAL cds alongside dated JY.19.90. H&G 1. 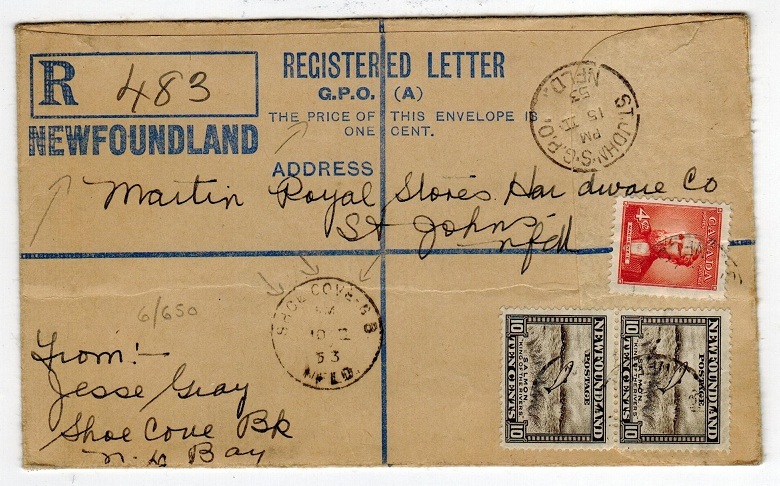 NEWFOUNDLAND - 1941 1st day cover to UK used at ST.ANTHONY/I.G.A. 1941 (DEC.1.) illustrated '50th Years Of Service For Labrador' first day cover addressed to UK bearing 5c adhesive tied by oval ST.ANTHONY NFLD/I.G.A. cancel. 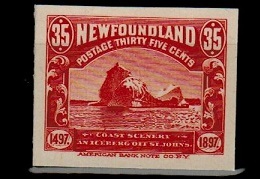 NEWFOUNDLAND - 1930 cover to Canada used at GRAND FALLS PO. 1930 (JAN.4.) 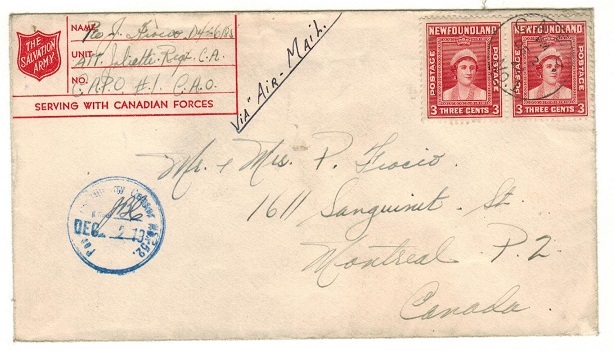 cover addressed to Canada (opened on two sides) bearing 1c and 3c adhesives tied by violet GRAND FALLS PO/NEWFOUNDLAND cds. 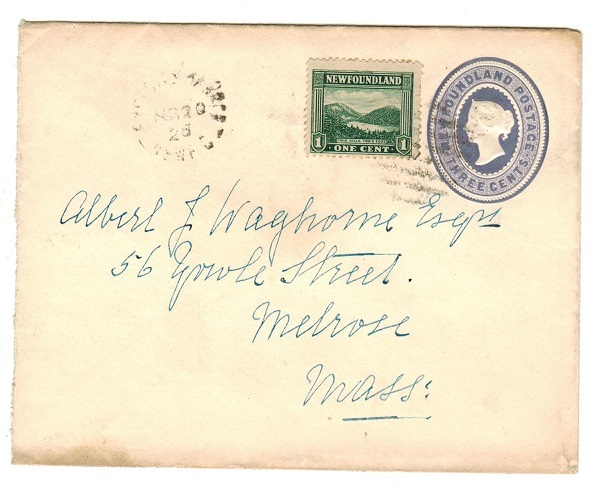 NEWFOUNDLAND - 1927 4c rate cover to USA used at POSTAL TELEGRAPHS/STEPHENVILLE CROSSING. 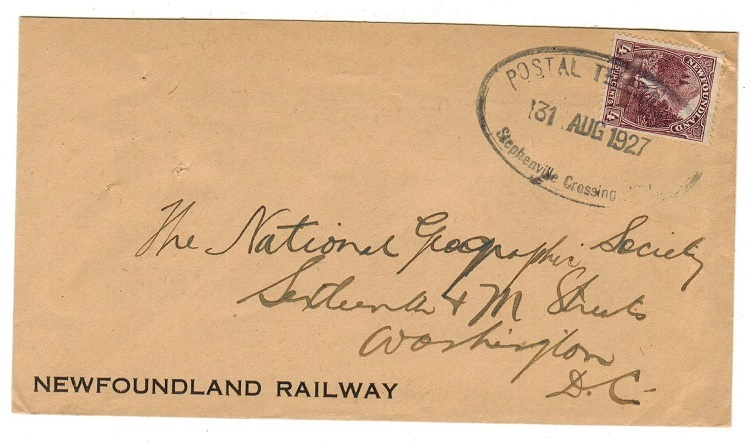 1927 (AUG.31) use of pre-printed 'Newfoundland Railway' envelope to USA bearing 4c (SG 152) tied by black d/r oval POSTAL TELEGRPAHS/STEPHENVILLE CROSSING NWLD h/s. 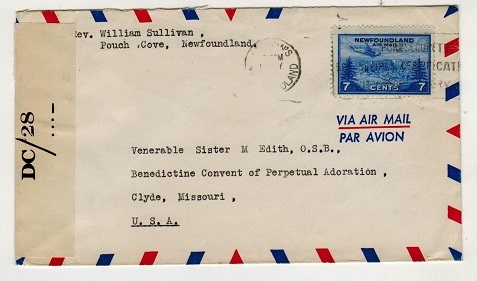 NEWFOUNDLAND - 1930 4c rate cover to USA used by St.J & P.A.B railway. 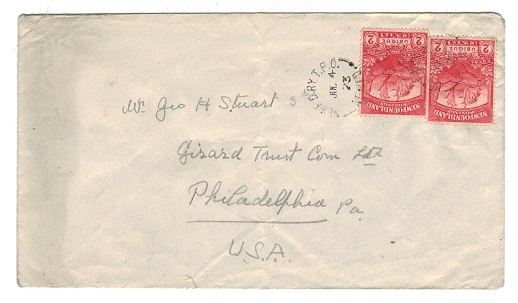 1930 (JUL.6) cover to USA bearing 2c pair (SG 165) tied by St.J&P.A.B.-R.P.O./EX2 cds with similar alongside. A fine railway strike. 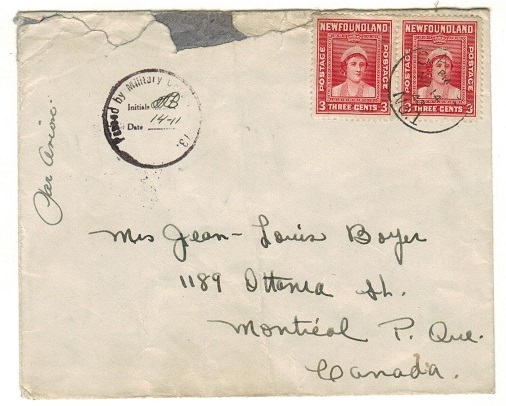 NEWFOUNDLAND - 1931 15c rate local cover with boxed BURIN NORTH cancel. 1931 (MAY.26.) cover addressed to St.John's (roughly opened on reverse) bearing 15c 'Aeroplane/dog' adhesive (SG type 103) cancelled by scarce violet boxed POST OFFICE/BURIN NORTH cancel. NEWFOUNDLAND - 1932 $1 blue 'Wayzata' mint block of four. 1932 $1 Blue 'Wayzata' adhesive in a very fine mint block of four printed for the 1st Trans- Atlantic flight to raise funds. Only 25,000 copies were actually sold. A scarce multiple. 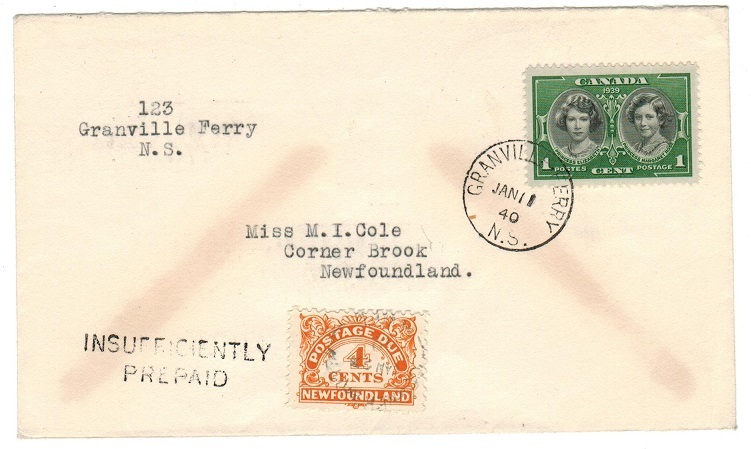 NEWFOUNDLAND - 1940 local underpaid cover with 4c 'postage due' (SG D4) added. 1940 (JAN.11.) cover addressed locally bearing 1c tied GRANVILLE FERRY/N.S. but being under paid struck by black two lined INSUFFICIENTLY/PREPAID handstamp with 4c orange 'postage due' adhesive added (SG D4) cancelled by CORNER BROOK cds dated JAN.22.40. 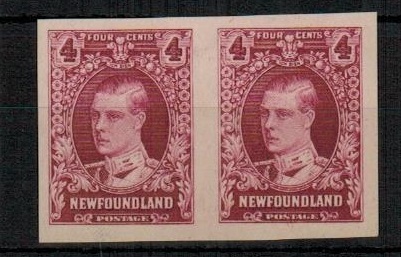 NEWFOUNDLAND - 1940 (circa) FORMULA type RPSE (size K) unused. H&G 1c. 1940 (circa) blue on cream FORMULA type REGISTERED LETTER/G.P.O. 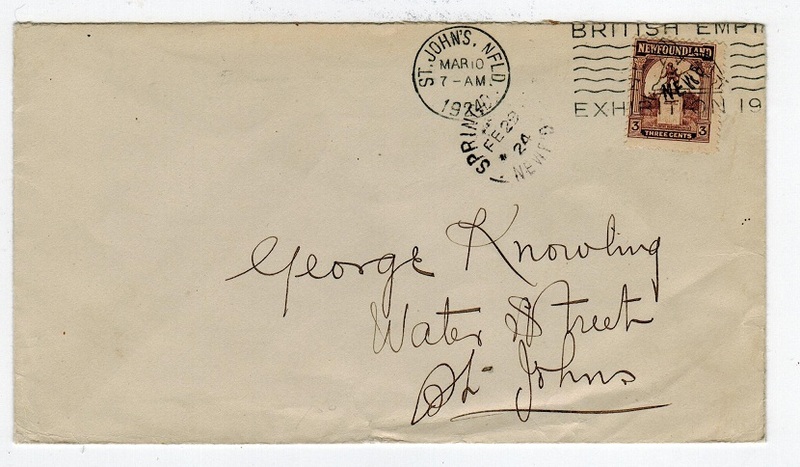 (D) envelope in unused condition of the scarce 'K' size. H&G 1c. 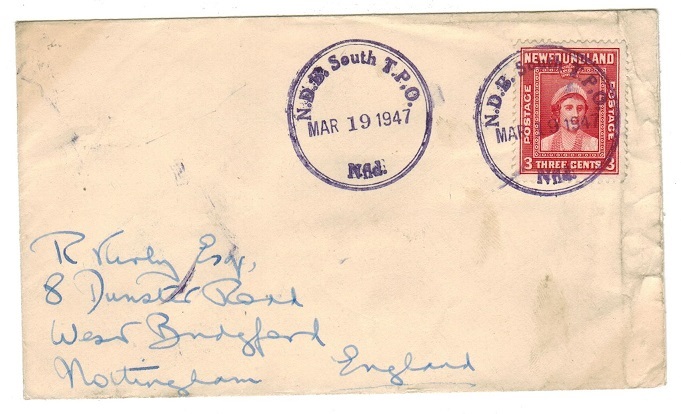 NEWFOUNDLAND - 1947 3c rate cover to UK used at N.D.B.SOUTH T.P.O. 1947 (MAR.19.) 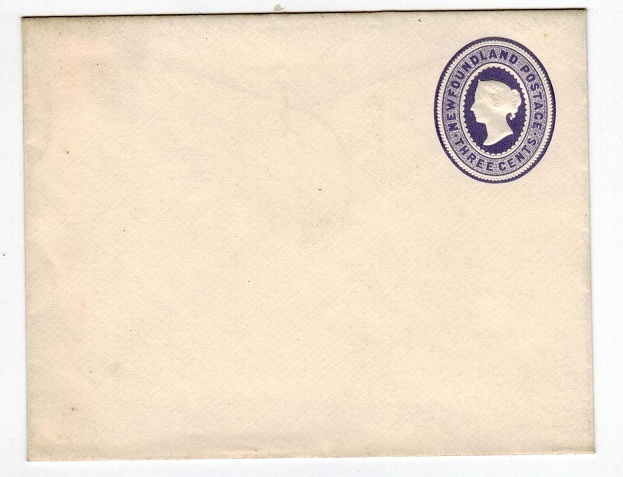 cover addressed to UK bearing 3c adhesive tied by scarce violet circular N.D.B. SOUTH T.P.O./Nfld cds with additional strike alongside. 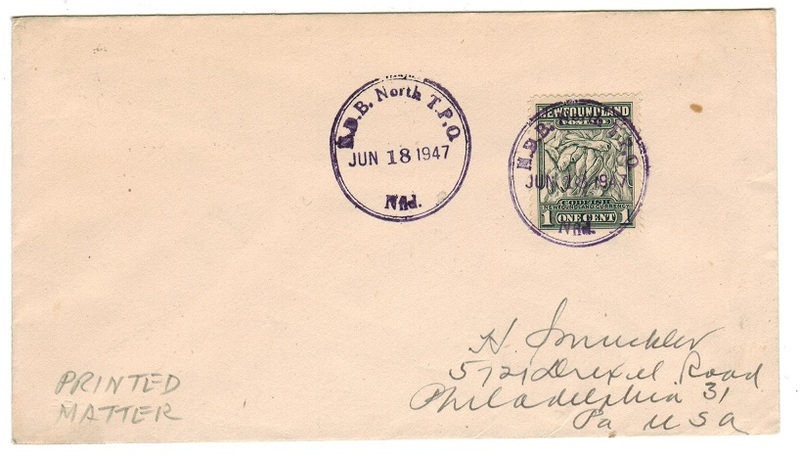 NEWFOUNDLAND - 1947 1c printed matter rate cover to USA used at N.D.B.NORTH T.P.O..
1947 (JUN.18.) 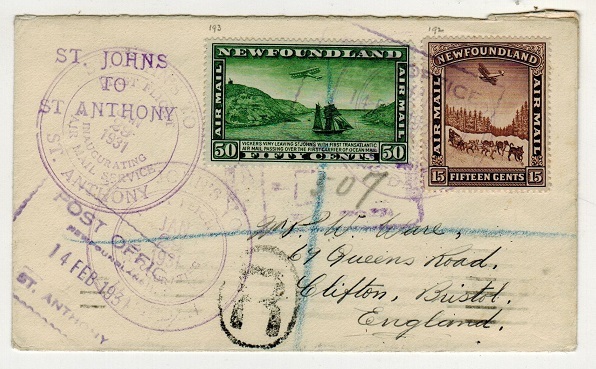 cover addressed to USA marked 'Printed Matter' bearing 1c grey tied by violet d/r N.D.B.NORTH T.P.O./Nfld cds with additional strike at left. A nice district cancel. 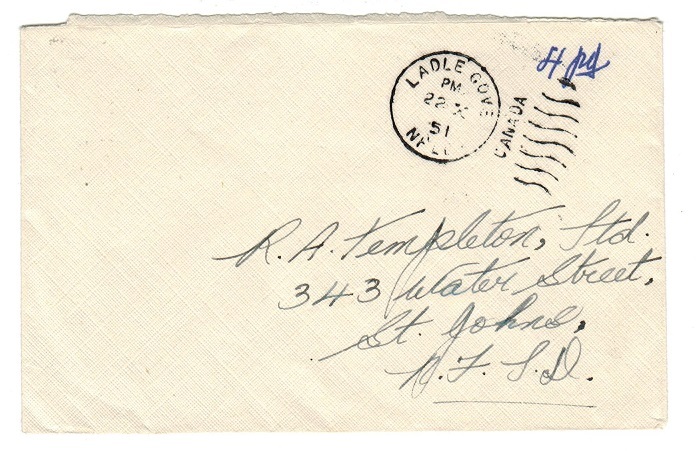 NEWFOUNDLAND - 1951 stampless '4d PAID' cover addressed to St.John's used at LADLE COVE. 1951 (22.X.) 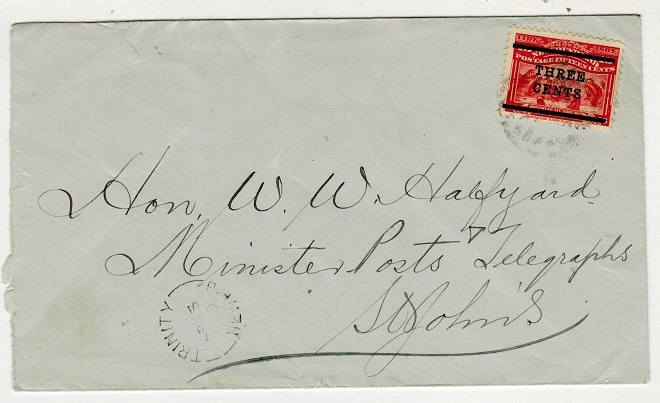 stampless cover addressed locally to St.Johns marked '4 pd' (4c paid) in violet manuscript and cancelled by LADLE GOVE/NF'DL/CANADA strike. A scarce manuscript paid cover presumably because the lack of postage stamps. 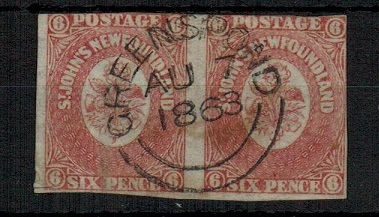 NEWFOUNDLAND - 1880 2c PSC to UK used at ST.JOHNS CENTRAL. H&G 4. 1880-90 2c orange on cream postal stationery postcard addressed locally and cancelled by barred duplex with ST.JOHNS CENTRAL/NEWF'D cancel alongside dated DE.11.89. H&G 4. NEWFOUNDLAND - 1910 5c 'cupids' (no gum) overprinted MONEY ORDER/STAMP TAX/ONLY. 1910 5c bright blue 'Cupids' in unused condition (no gum) overprinted in red MONEY ORDER/ STAMP TAX/ONLY. NEWFOUNDLAND - 1944 censor cover to USA. 1944 (OCT.24.) 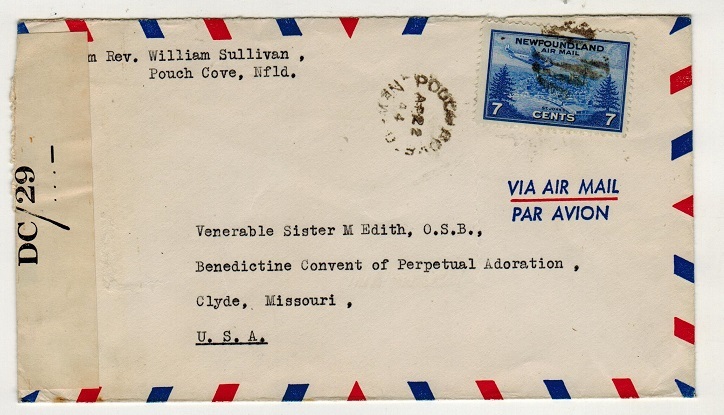 cover addressed to USA bearing 7c 'air mail' adhesive tied by ST.JOHNS slogan strike and with black on cream P.C.90/OPENED BY EXAMINER/ DC/40 censor label at left side. (Little type NL7A). NEWFOUNDLAND - 1943 censor cover to USA. 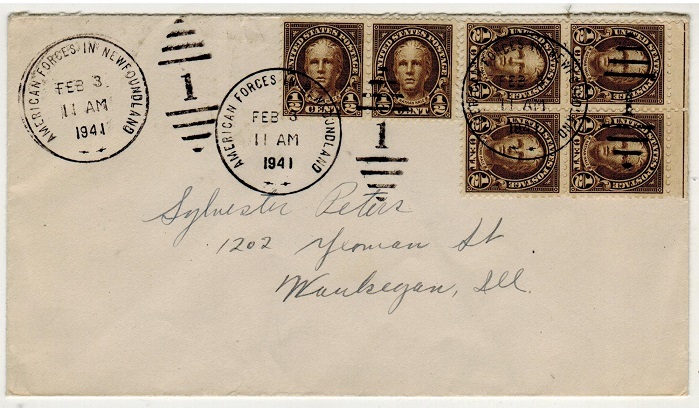 1943 (circa) cover addressed to USA bearing1c strip of four adhesive tied by light slogan strike strike and with black on cream P.C.90/OPENED BY EXAMINER/ DC/33 censor label at right side. (Little type NL7A). NEWFOUNDLAND - 1907 $1 LABRADOR perforated label unused. 1907 $1 black, red and green on white perforated LABRADOR/ONE DOLLAR/USA POST OFFICE label in fine unused condition. A fine unused example (no gum) of this bogus stamp which was produced in order to suggest that there was a Post Office Labrador in the USA. NEWFOUNDLAND - 1923 4c rate cover to USA cancelled by NEWF'd. RY.TPO railway strike. 1923 (JUL.4.) 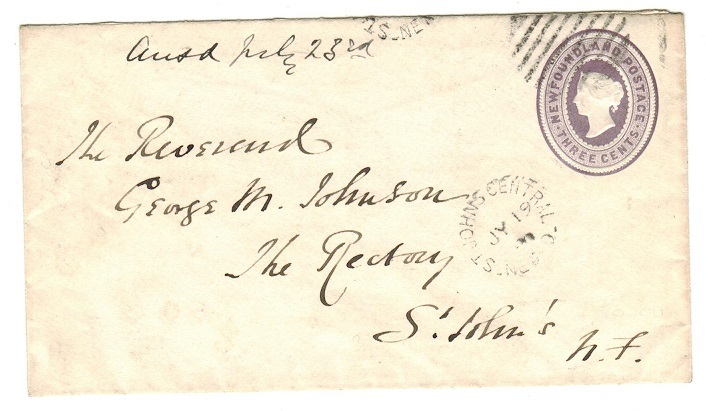 cover addressed to USA (central fold) bearing 2c 'Caribou' adhesive (x2) tied by NEWF'D RY. TPO cds. NEWFOUNDLAND - 1921 3c rate cover to USA cancelled by light NEWF'd.RY.TPO railway strike. 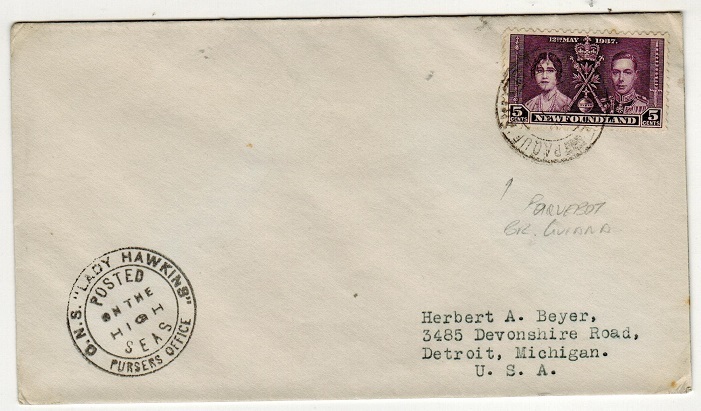 1921 cover addressed to USA bearing 3c brown 'Caribou' adhesive tied by a rather light strike of the NEWF'd RY. TPO railway cancel. 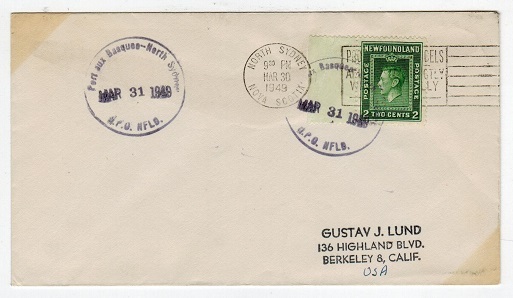 NEWFOUNDLAND - 1949 PORT AUX BASQUES NORTH SYDNEY cover addressed to USA. 1949 (MAR.30.) 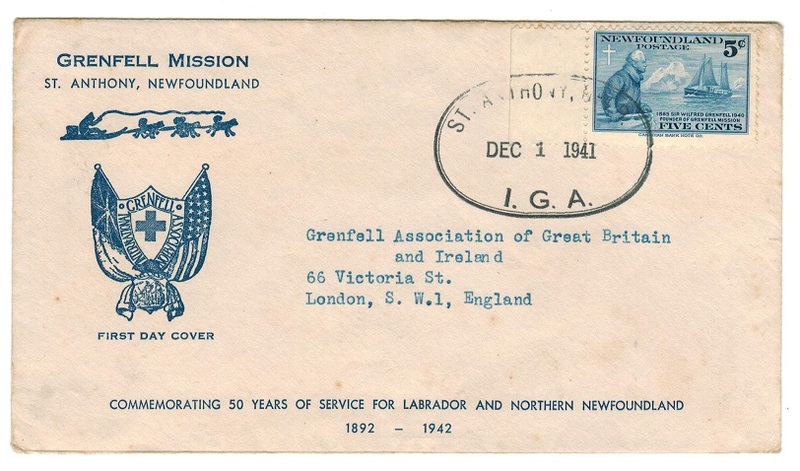 cover addressed to USA bearing 2c green tied by NORTH SYDNEY/NOVA SCOTIA slogan strike with violet-black PORT AUX BASQUES NORTH SYDNEY/GPO.NFLD transit strikes applied the next day. 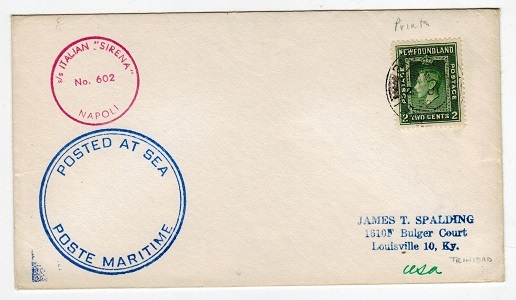 NEWFOUNDLAND - 1952 S/S ITALIAN maritime cover to USA cancelled PAQUEBOT/TRINIDAD. 1952 (JU.2.) cover addressed to USA bearing 2c adhesive tied by PAQUEBOT/TRINIDAD cds with large blue d/r POSTED AT SEA/POSTE MARITIME h/s at left and small red S/S ITALIAN SERENA/No.602/NAPOLI strike. 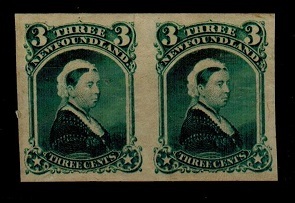 NEWFOUNDLAND - 1868 3c IMPERFORATE PLATE PROOF pair in blue-green. 1868 3c IMPERFORATE COLOUR TRIAL pair printed in blue-green on ungummed India paper. (SG type 14). NEWFOUNDLAND - 1865 24c blue IMPERFORATE PLATE PROOF pair. 1865 24c IMPERFORATE PLATE PROOF pair (SG type 11) of Queen Victoria printed in the issued colour of blue on thick white card. 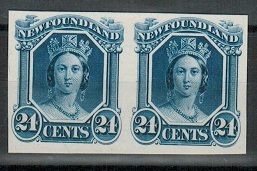 NEWFOUNDLAND - 1889 5c blue PSE used from ST.JOHNS. H&G 2a. 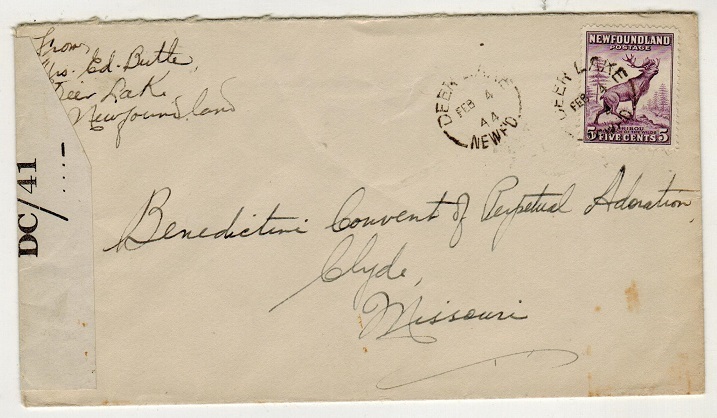 1889 5c blue on cream postal stationery envelope (size b) addressed to USA cancelled by barred duplex with ST.JOHNS/NEWF'D cds alongside dated MY.14.92. H&G 2a. NEWFOUNDLAND - 1897 1/2c (SG type 39) IMPERFORATE PLATE PROOF. 1897 1/2c IMPERFORATE PLATE PROOF printed in the issued colour of olive on gummed paper. (SG type 39). 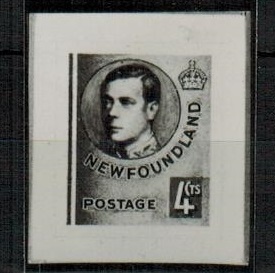 NEWFOUNDLAND - 1911 12c (SG type 66) PLATE PROOF. 1911 12c 'Coronation' PLATE PROOF printed in black on very thick glazed card. (SG type 66). Fine & scarce. 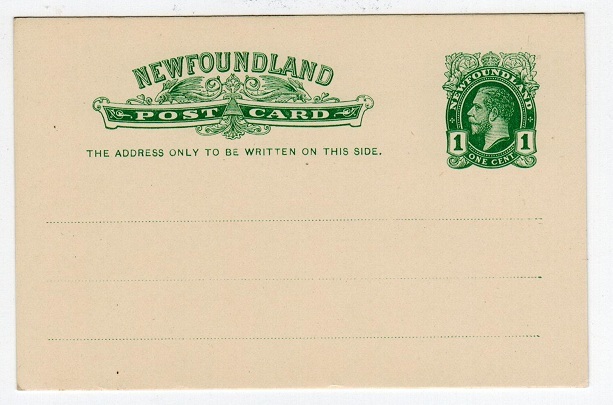 NEWFOUNDLAND - 1911 1c green PSC unused. H&G 9. 1911 1c green on cream postal stationery postcard in fine unused condition. H&G 9. 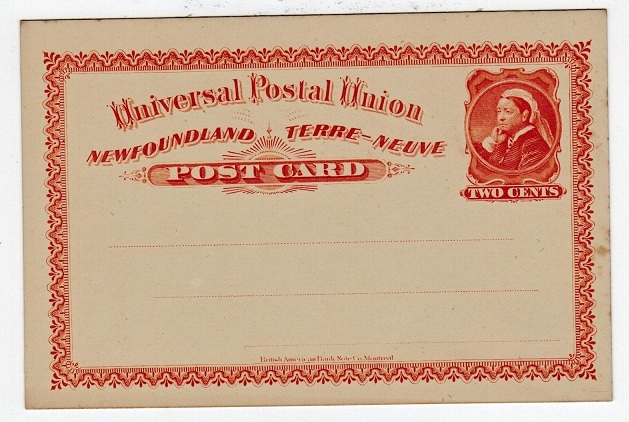 NEWFOUNDLAND - 1911 2c red PSC unused. H&G 10. 1911 2c Red on cream postal stationery postcard in fine unused condition. H&G 10. NEWFOUNDLAND - 1911 15c lake IMPERFORATE PLATE PROOF. 1911-16 15c Lake IMPERFORATE PLATE PROOF in issued colour on thin gummed card. (SG127). 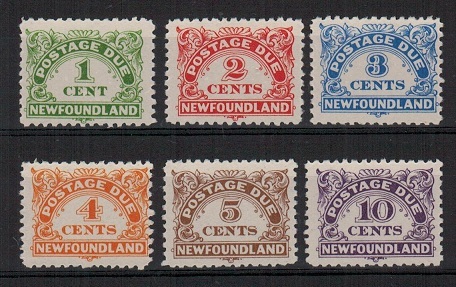 NEWFOUNDLAND - 1939 'Postage Due' set mint. SG D1-D6. 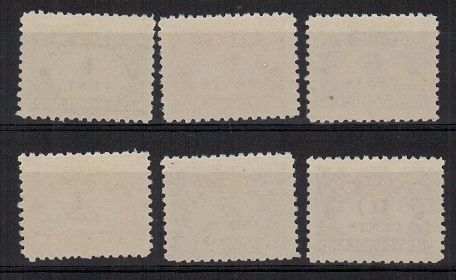 1939-49 POSTAGE DUE Series of 6 values in very fine mint condition. SG D1/D6. 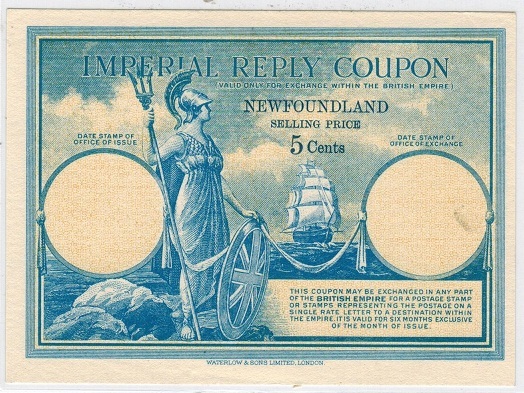 NEWFOUNDLAND - 1940 (circa) 4c IMPERIAL REPLY COUPON. 1940 (circa) NEWFOUNDLAND/SELLING PRICE/5 CENTS overprint applied to IMPERIAL REPLY COUPON (Robin type 1) in fine unused condition. Printed by Waterlow and Sons. Unusal item unused. 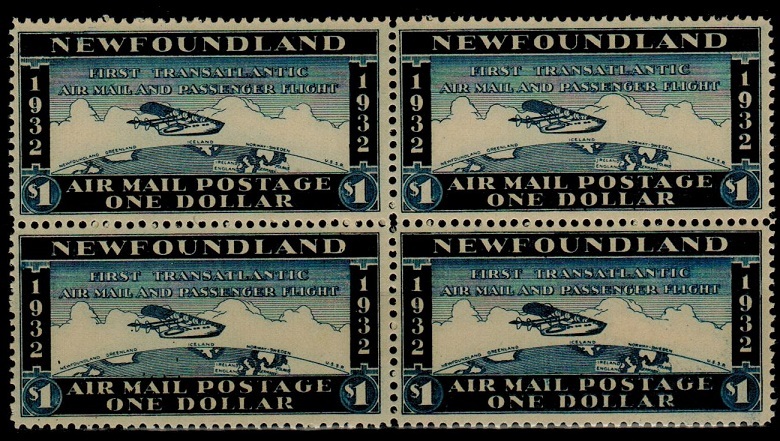 NEWFOUNDLAND - 1941 set (ex 7c) in IMPERFORATE PLATE PROOFS. 1941-44 series (ex 7c) in fine IMPERFORATE PLATE PROOFS all printed on gummed watermarked paper in issued colours. All have security punch hole & with minor archive bends. (13 proofs). 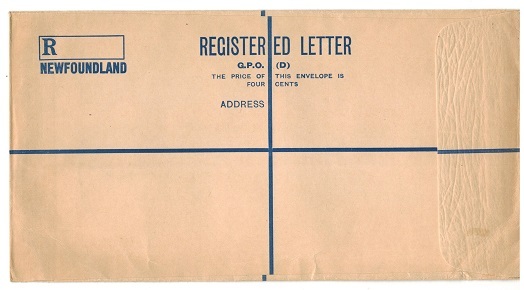 NEWFOUNDLAND - 1953 FORMULA NEWFOUNDLAND GPO (A) envelope used at SHOE COVE. 1953 use of blue on buff FORMULA NEWFOUNDLAND GPO (A) registered envelope (size G) addressed locally & bearing 10c pair (SG215) in combination with 'Canadian 4c adhesive & tied by SHOE COVE/NFLD cds dated 10.II.53. An unusual combination use on this scarce piece of stationery. NEWFOUNDLAND - 1924 local cover with BRITISH EMPIRE EXHIBITION strike. 1924 (FE.29.) 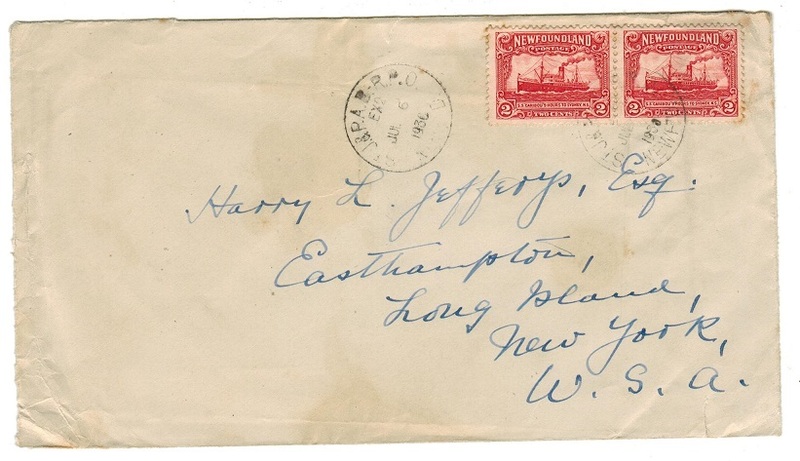 cover addressed locally to St.Johns bearing 3c adhesive with SPRINGDALE/NEWD cds at left and cancelled on arrival by BRITISH EMPIRE/EXHIBITION 1924 slogan strike at St.Johns. 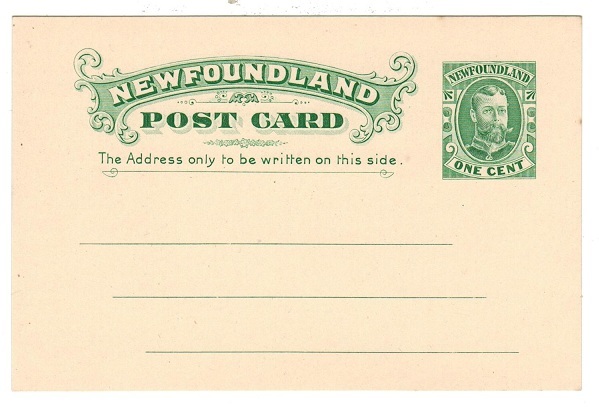 NEWFOUNDLAND - 1915 1c green PSC unused. H&G 12. 1915 1c green on cream postal stationery postcard in fine unused condition. H&G 12. 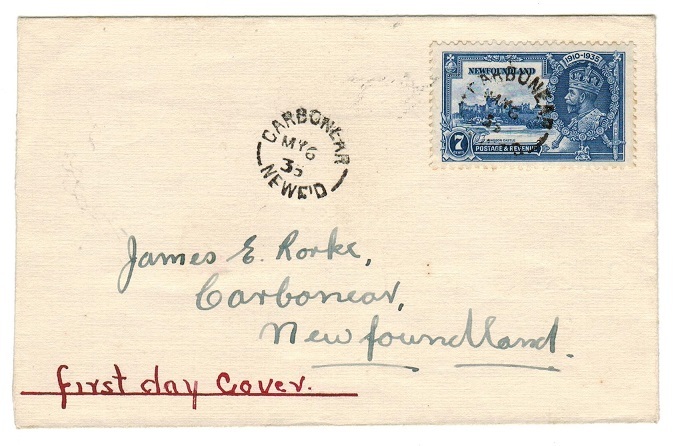 NEWFOUNDLAND - 1919 POSTAGE PAID cover with slogan strike. 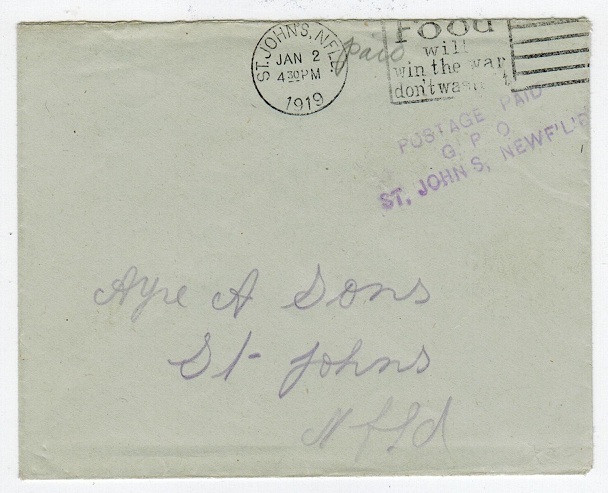 1919 (JA.2) Stampless cover addressed locally cancelled by ST.JOHN'S/FOOD WILL WIN THE WAR DON'T WASTE IT slogan strike with scarce violet POSTAGE PAID/G.P.O./ ST.JOHN's NEWFOUNDLAND h/s. 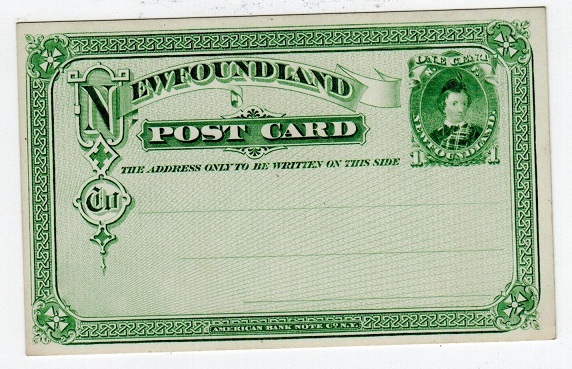 NEWFOUNDLAND - 1889 5c blue PSE unused. H&G 2a. 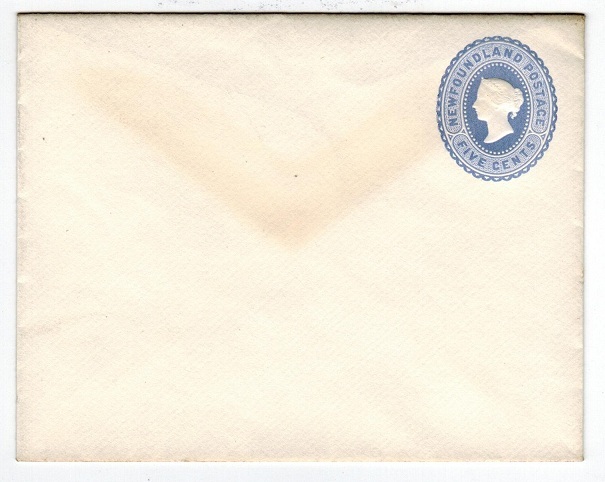 1889 5c blue on cream postal stationery envelope (size b) in fine unused condition. H&G 2a. NEWFOUNDLAND - 1889 3c violer PSE unused. H&G 1a. 1889 3c violet on cream postal stationery envelope (size b) in fine unused condition. H&G 1a. 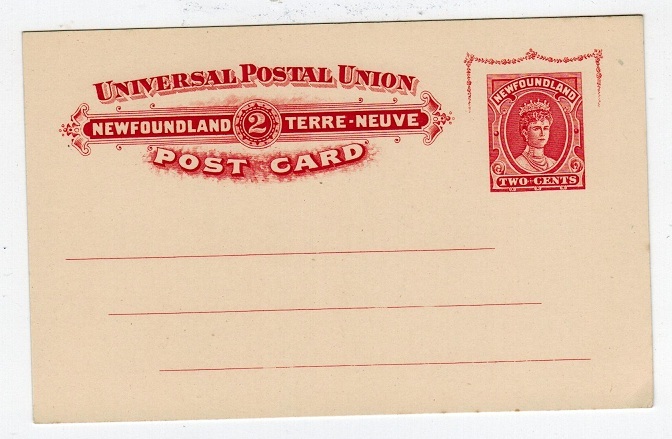 NEWFOUNDLAND - 1880 2c orange PSC unused. H&G 4. 1880-90 2c orange on cream postal stationery postcard in fine unused condition. H&G 4. 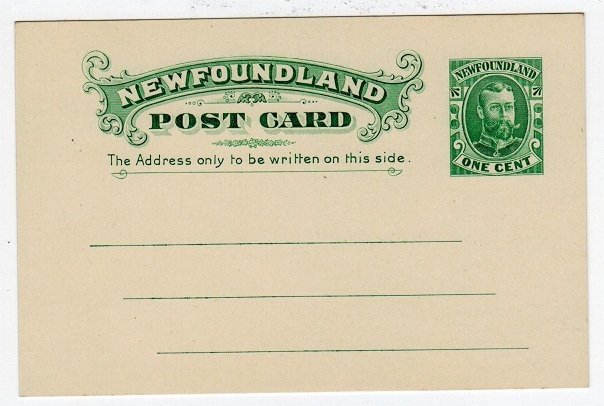 NEWFOUNDLAND - 1873 1c green PSC unused. H&G 1. 1873 1c green on white postal stationery postcard in fine unused condition. H&G 1. 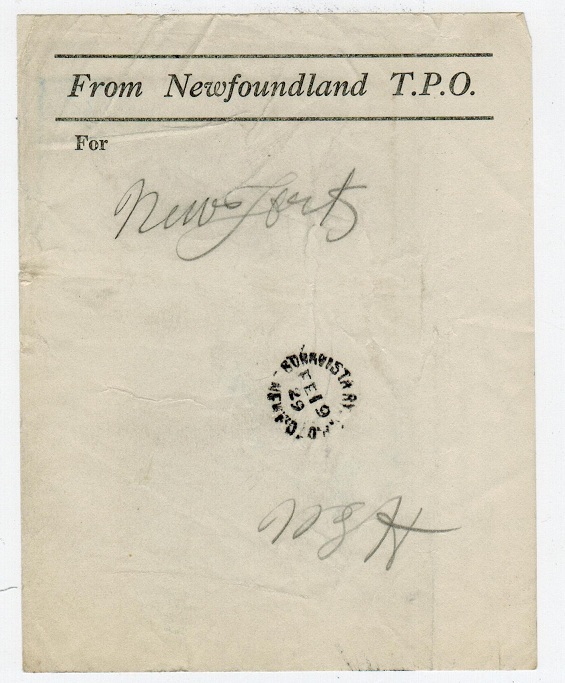 NEWFOUNDLAND - 1929 use of TPO form used at BONNISTRA RAILWAY. 1929 (FE.19.) use of black on cream NEWFOUNDLAND T.P.O. form to New Forest cancelled BONNISTRA RY/R.P.O. A fine railway use. 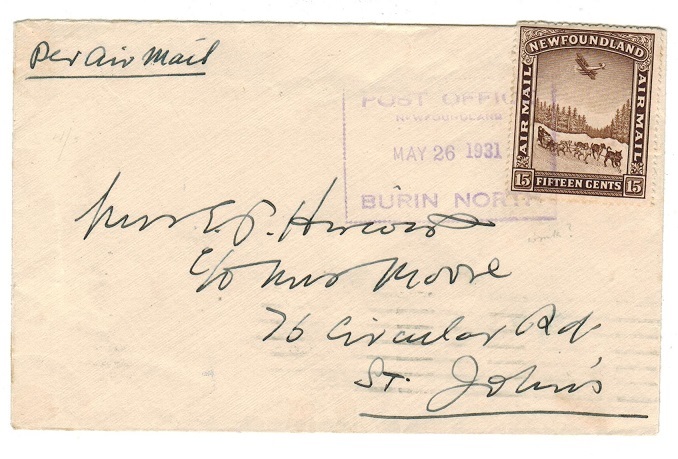 NEWFOUNDLAND - 1902 cover to USA used at HARBOR GRACE. 1902 (JU.6.) 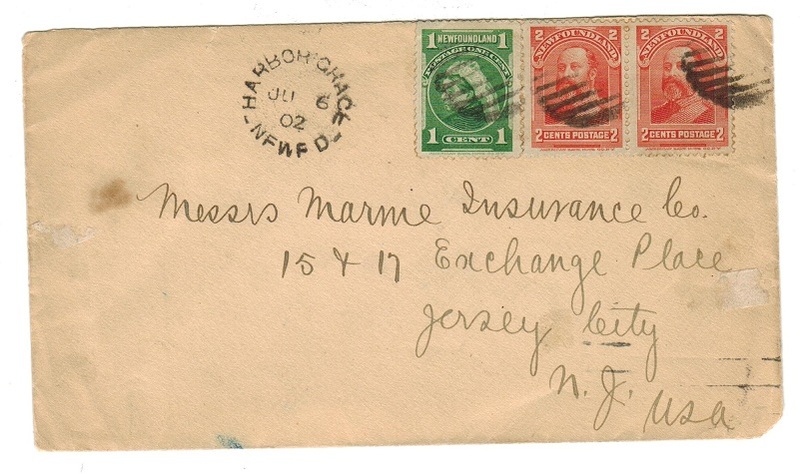 cover addressed to USA bearing 1c and 2c pair (SG 85+86) tied by barred duplex wih HARBOR GRACE/NEWFD cds alongside.